I have these pieces, constructed a shown, that were given to me in a pile. Is this part of a set or something someone just build? At first glance it looks like something out of Model Team set, like one of the trailers. There are two types of standard Technic pins, black friction pins and grey frictionless pins. Black friction pins are used to build strong connections and grey frictionless pins have low friction and allow parts to spin easily. 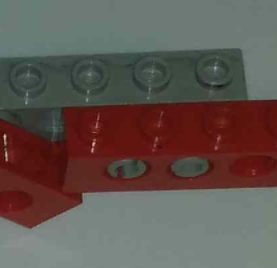 It seems odd that the two pins connecting the Technic bricks as shown below use grey frictionless pins as I have never seen an official LEGO set that wouldn't use black friction pins for this case. The window also stands out as an odd feature in this build. This is a real tough one.. I personally wasn't able to find a set that includes all the pieces in the pictures you included, but I found one that comes pretty close. My guess is that it is a late 80s or early 90s technic set. What I found which has most of the parts, save for the window element in the middle of your pictures and maybe a couple of the red elements is set 8064-1.
and some assorted technic elements like axles and bushings as well as some other red elements. Hope this aids you in your search! I can't remember a Technic set with a small Lego Classic window, so to me it looks like a creative mind at work. In early days there were no black friction pins. Studded beams in red and gray remind me of a caterpillar backhoe or bulldozer set from the 1st half of the 1980s. The toothed half width bush also places the parts halfway the 1980s. This is certainly a remainder of a "moc"
With the introduction of Technic in 1977 only the gray friction-less pins existed, so these where used in all Technic constructions by Lego. Black friction pins are introduced is 1982 (look carefully at the set pictures in the following links: 1981 & 1982). This resulted that from 1982 on the gray pins where only used in parts that needs movement. So the double gray pin usage in the photo, if original by Lego must be from 1981 or earlier. 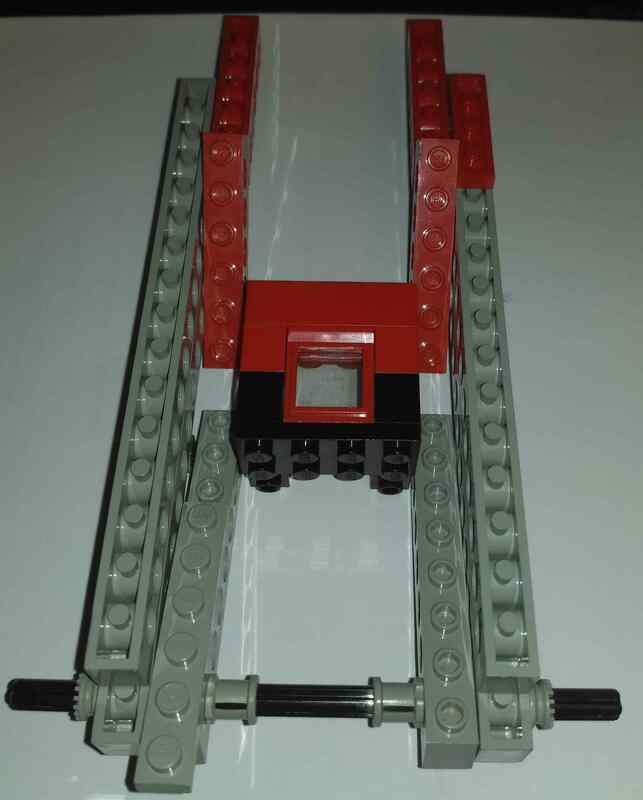 The second clue found is the Light Gray 1x16 technic beam. This part is introduced in 8851-1: Excavator, which is a set from 1984.